Near the end of the first week of my KISSS healthy-eating plan, calamity struck–or at least what passes for calamity when you are trying to cook and eat healthy soups every day. I went to the pantry and found that I had no onions. No onions! Take a look at almost any of my savory recipes and you’ll see the same first step: “Saute onions in a non-stick pan.” Onions provide the flavor base on which all of my soups are built, and without onions, I definitely couldn’t cook the soup that I had planned to. It was almost dinner time, so rather than make a trip to the store for one item, I took a look in my freezer and pantry to figure out what I could make with what I had on-hand. In the freezer I had a package of Cajun-Style Mirepoix blend (onions, green peppers, and celery) and several bags of mixed vegetables, including a gumbo blend. 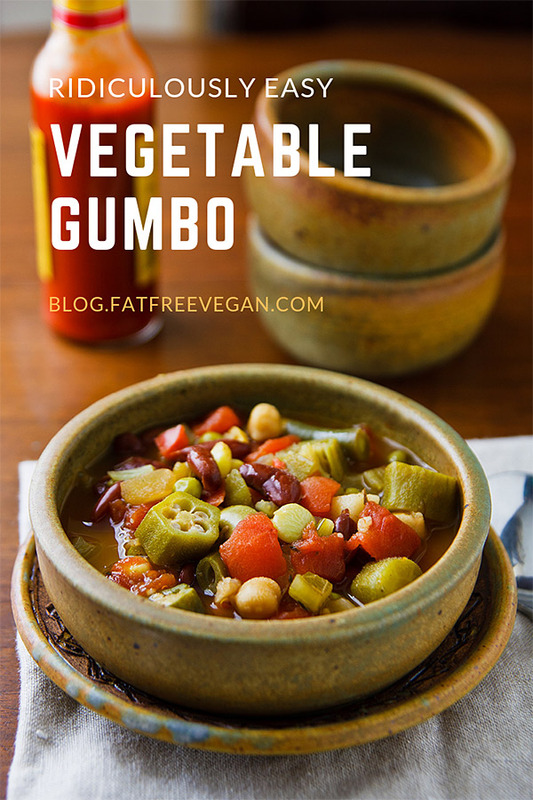 Using them and canned tomatoes and beans from my pantry, I managed to make an amazingly good gumbo in under a hour, and the only vegetable I had to chop was the garlic. Having a well-stocked freezer and pantry can rescue you when you’re running short on fresh ingredients and might be tempted to reach for something processed and unhealthy. People often ask me what I keep on-hand at all times, but I’ve never really taken stock and written it down. Until now. 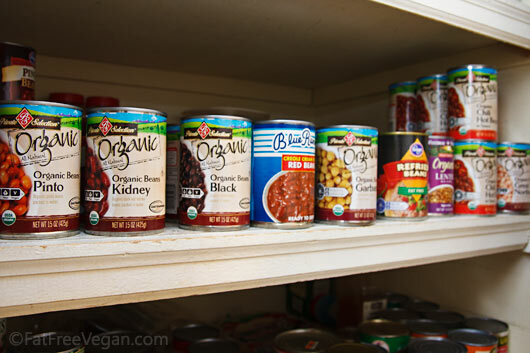 Excluding fresh fruits and vegetables, which vary by the season, here are the basic ingredients that I always keep in my pantry and freezer. Click on “Print” if you’d like to print the lists (the photos will print also). 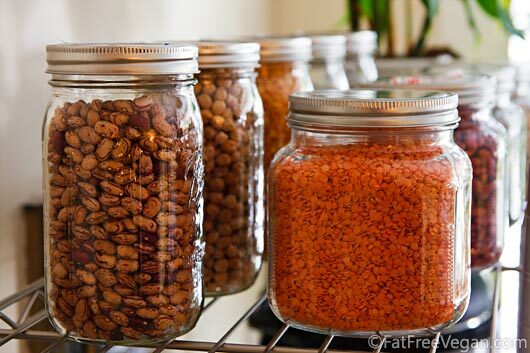 Dried Beans: split-peas, yellow split-peas, lentils, red lentils, chickpeas, black, kidney, pinto, great northern, limas, etc. Flour: white whole wheat flour, chickpea flour, cornmeal, brown rice flour, wheat gluten, etc. Of course, as soon as I post this, I’ll think of other ingredients that are absolutely indispensable, and I’ll add them as they come to mind. The point is, with a well-stocked pantry and freezer, you can always whip up a meal in a hurry, no matter how bare your refrigerator is. Fresh veggies are always tastier, but frozen ones are just as nutritious (sometimes more so), usually less expensive, pre-chopped, and very quick and convenient to use. Though I used packaged, frozen vegetables for everything including the onion blend, you can use whatever fresh vegetables you have on hand. 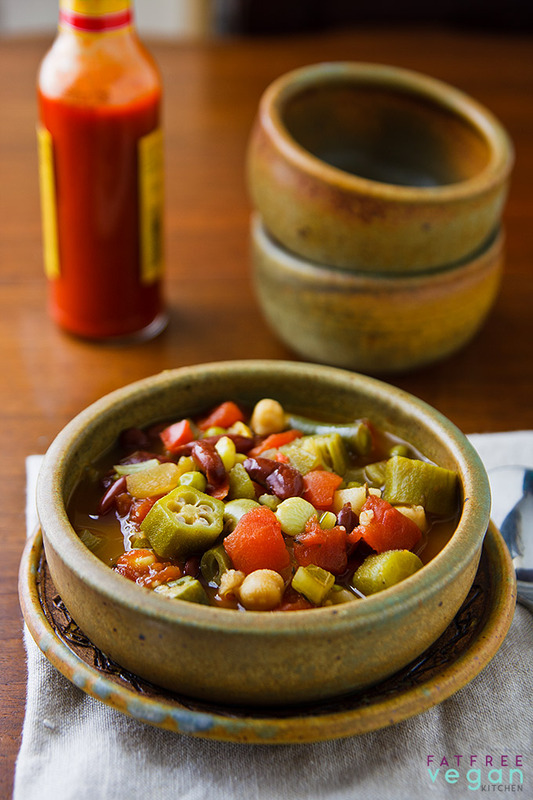 Try to include some okra: it makes this a gumbo rather than just a vegetable stew. Heat a non-stick stock pot and saute the onion, pepper, and celery over medium heat until completely thawed (if frozen) and softened. Add all remaining ingredients EXCEPT the file powder and hickory salt. Cover and bring to a boil. 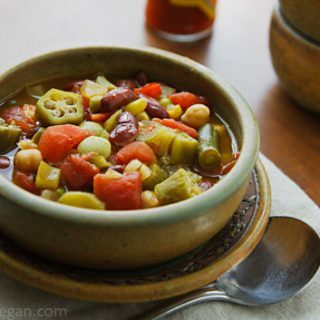 Reduce heat and simmer until vegetables are tender, about 40 minutes, adding additional water as needed to form a thick stew. Add file powder and smoked salt and adjust seasonings as needed, adding salt and hot sauce to taste just before serving. Serve alone or over rice or other grain with additional hot sauce. 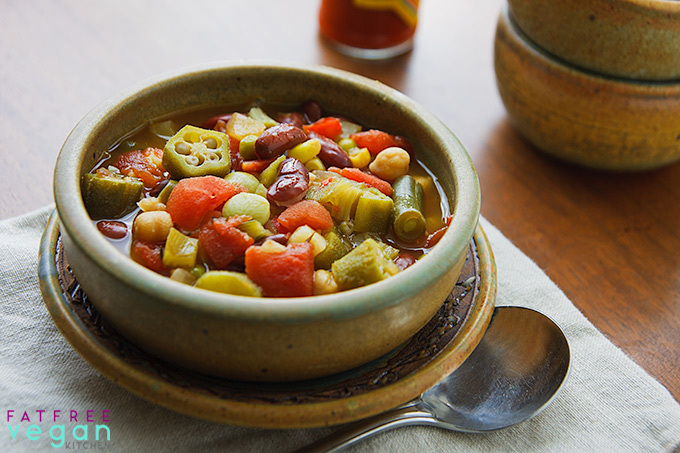 Using zero-point vegetable broth, this recipe is zero points on Weight Watchers Freestyle program. I always love visiting your site and am so grateful that you share your culinary gifts and talents with us all. Thanks! Wow!!! I’m new to this way of eating and my son, who gave up meat and dairy several months ago, shared your website with me. I’m so glad to find your extremely helpful information. I see that I would really enjoy an Instantpot, so that probably will be one of our next expenditures. 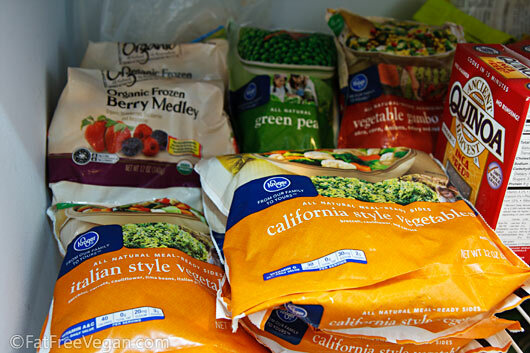 My husband and I stocked our freezer and pantry with many of these items this week, but I am glad to see more suggestions from your pictures and blog. Thank you very much. I will look for your posts on Facebook. Just noticed your great picture. You’re looking healthy!! !